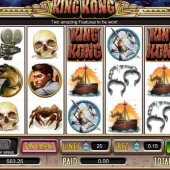 Leading slots developer Cryptologic know a thing or two about big-movie tie-ins when developing online video slots. They have famously produced some very successful slots based on comic books like Spider-Man Revelations and Batman, of course. Producing a slot adaptation of that behemoth of movie history, King Kong, should have been pretty simple, then. Before we start, it should be noted that this slot should not be confused with the Playtech Kong slot that was based on the 2005 remake of the same name! You Could Win a $150,000 Jackpot! A 5-reel, 25-payline slot, Cryptologic certainly have laid on the extras, with a wide inclusive range of betting, a massive jackpot of $150,000, and some nice bonus features. The game screen background puts you right in the movie mood with a moody backdrop of New York City – King Kong’s final destination, of course – and searchlights trying to pick out the gigantic gorilla as he shimmies his way up the Empire State Building. If you’re familiar with the classic film, the reel symbols will be easily recognizable – film cameras, dinosaurs, ships and hunters, the main characters of Jack and Anna, plus the over-sized monkey himself. Anne actually pays out the biggest amount of swedge, bagging you a 7,500x line bet – that’s a whopping $150k if you’re playing at the top stakes. 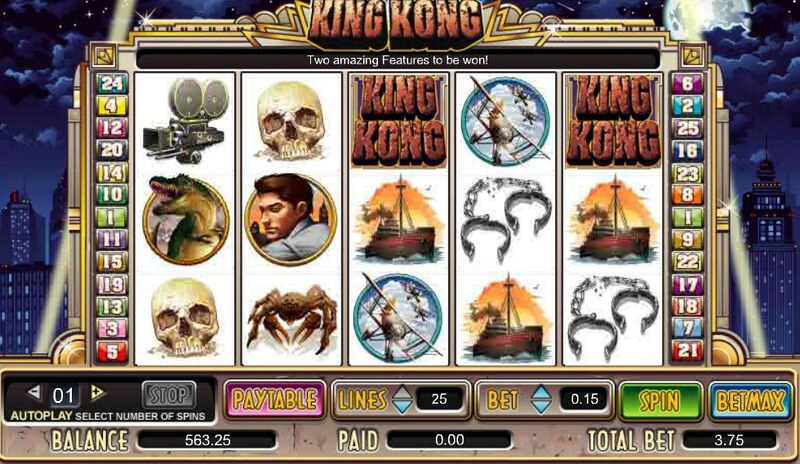 Anne may pay well, but it’s King Kong who acts as the game’s Wild, appearing on Reels 2-4 only and substituting for all other symbols except the Scatter. If he appears on reel 3 Kong will ‘go Ape’ and expand to fill the entire reel in all his movie-tastic glory. Three or more King Kong logos on the reels activates the King Kong Smash bonus feature. This is where you can flex your best plane-smashing muscles, swiping bi-planes out of the sky and earning more free spins as you go. Once you have missed a plane three times you can either start your free spins or bag a mystery win. he sound FX really make this game (make sure your headphones are on while you’re playing), as the reels spin furiously and land with a thump. When Kong appears and expands on Reel 3 the entire screen shakes – it’s pretty exciting stuff. Bonus hounds may bemoan any extra features other than the free spins, but for fans of good, old-fashioned slots play, you can’t go wrong with a bit of Kong.